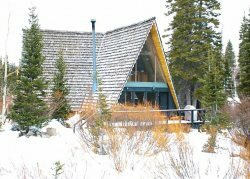 Uinta Lodge is a home convenient for those with kids who want to ski back to the house for lunch or warming up. Many find it so comfortable they have a hard time making it back to the slopes. The fully equipped kitchen has a bar for serving quickly and a dining room that seats up to 9 for a more formal atmosphere. The decor provides the feel of comfort in a mountain setting. With most floors carpeted, one can putter around comfortably in stocking feet. The living room is open from the kitchen and boasts a large wood fireplace for those seeking the smell of pine. Deep sofas and a large flat screen TV in the family room are why the outdoors seem less enticing to kids and adults alike. Venturing out can simply mean a trip to the large hot tub on the private deck. There is also plenty of outdoor space to play and dig forts. The skiing is just steps up the road with access to the Great Western quad lift. Four bedroom and two bathrooms are situated on the main floor which sleep up to 11 (including the futon couch in fourth bedroom). The attached garage provides easy access from the outside for groceries and gear. Free WiFI and onsite Washer/Dryer unit. Communication was great and access to the home was easy. Uinta was a lovely home base for our family ski weekend at Brighton Resort. We loved the cozy roominess of the home and the real wood burning fireplace and the hot tub were perfect. This cabin blew my expectations away! It is so beautiful, so well kept, and they even have pictures and books about the history behind it. They were very helpful when we got stuck in the snow, and with any questions we had, tips and even a referral to a massage therapist (for after a long ski day). I would definitely reserve this place again, I wish I could give it more stars! I would recommend 4x4 or snow tires for the winter, but we were able to get in an out with some help. They keep the road pretty well plowed. We had a fantastic time! The cabin was incredibly clean. Perfect space for a larger group. Hot tub was a hit, we loved it. We will be back for sure! The Uinta house was the perfect space for my friends and I to spend a weekend hiking, making great meals, and enjoying the mountains. The rooms were clean, there were plenty of beds, and the kitchen was great! We especially loved the large dining table where we could all sit around and talk. I would definitely recommend this home and would love to visit again.